To see Petey today, you would never suspect he was once living on the streets of Miami, Florida. When animal control picked him up, ticks speckled his small body, and his coat was matted. From his condition, they figured he had been on his own for a while. Abby’s Little Friends Rescue pulled him from the shelter, placed him in a foster home and listed him on Petfinder. Petey likes the bed made just so. Alyse Cohen of Orlando had been looking for a dog to adopt for a few months. She confined her Petfinder search to shelters and rescues nearby, but then one day, she expanded it and up popped Petey. “He had the saddest, cutest looking little face, but his written description is what sold me,” Alyse says. “I contacted the rescue right away. 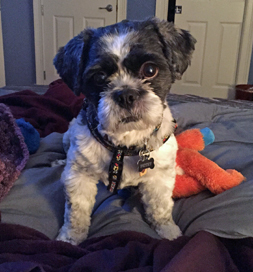 After a handful of phone calls, background checks and a home inspection, I made a two-hour drive and his foster parents met me halfway.” She took him home that day. The house itself is not the same either. “Petey will not allow a bed to be neatly made,” she says. “He finds great joy in knocking off the pillows and fluffing up the blankets to his liking.” And while some dogs hate the bathtub, it’s his favorite watering hole: he likes drinking from the bathtub faucet. “He is the love of my life,” Alyse says, “and the greatest decision I could have ever made for myself,” and for Petey as well.